Well, a lot actually. People think very hard about what they will name their babies. Alicia and Paul had a whole list of names. They entertained a crowd at a party once, proposing name combinations and letting everyone vote. I attended by FACETIME and it was a fun process. The end result was a great name, Eliza Jane. Because words have meanings, connotations and then sometimes slang and new definitions (repurposing words like ‘bespoke’ and ‘cool’) there are many words/names which have multiple meanings – some even contradictory. For example, the flower called pansy is actually tough. Like the first Irishman out in the spring (Pati O’Furniture) pansies are so hardy they flourish and flower even if the temperature unexpectedly dips too low some spring night. 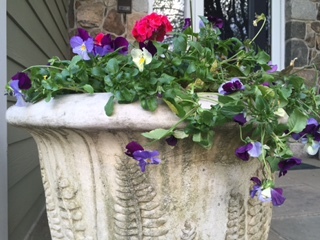 Pansies are not pansies, they will survive, blooming tough. Another name I never liked was Jane. While all my sisters were all named after my mother Hilda Susanna Cecilia Dengler McGlew, I was named Jane after my grandfather, John Francis. As if “plain Jane” wasn’t bad enough, my middle name for some reason had been the name of a talking mule on some early TV show, that I never got to see, but any kid who ever heard my middle name apparently had. The slang “plain Jane” originated sometime in the early 1900s and the definition varies from “unadorned, plain and modest” to “an unattractive woman”. But even if that hadn’t been the connotation of the name, it just was never glamorous enough for me. I couldn’t even make my initials into a fancy design. My Uncle Larry helped me come up with something that wasn’t horrible though. When I started writing I thought maybe I could finally have an enchanting nom d’plume. But no other name seems right. I’m not a Tiffany (wrong generation) nor am I a Lillian. So my children’s books are published under my plain old un-magic name. Maybe “Jane” doesn’t bother me so much any more because now there are so many wonderful, romantic, flowery, exotic first names that it could be argued that plain Jane has taken on a new connotation of distinction in its plainness. And maybe new parents will consider the name again — at least for a middle name like Eliza Jane. Or it could be that after umpteen years I have just gotten used to plain old Jane. Like a well worn pair of shoes that gets more comfortable through extended use, the name has grown on me. I think I unconsciously decided a long time ago I will give the name its connotations, not the the other way around.